Both the 2D and 3D routes can be calculated within navigation sectors. In case of the 2D routes, a point moves in the lower plane of the navigation sector (Z coordinate is not taken into account). If the height or radius set for this point is greater than the size of the navigation sector, such sector will be discarded from pathfinding. 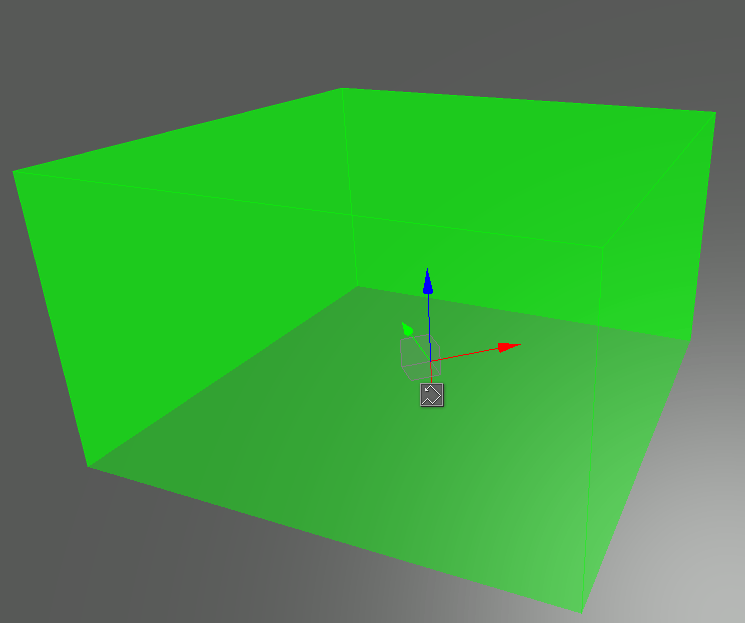 In case of the 3D routes, a point moves in 3 dimensions. If the radius set for this point is greater than the size of the navigation sector, it will be discarded from pathfinding. Routes can be calculated within several intersecting navigation sectors. The intersecting sectors will be treated as a single navigation area. In case of the 2D routes, the height difference between the intersecting sectors must not exceed the maximum height set for the 2D route; otherwise these sectors will be discarded from pathfinding. 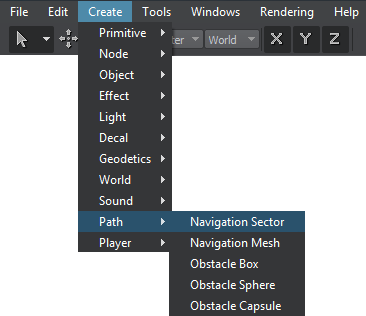 On the Menu bar, click Create -> Path -> Navigation Sector. Click somewhere in the world to place the navigation sector. 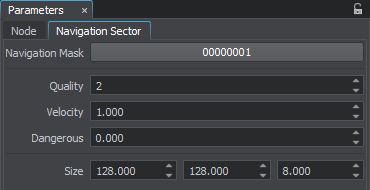 The new navigation sector will be added to UnigineEditor and you will be able to edit it via the Parameters window. The created navigation sector only provides an area within which the 2D and 3D routes are calculated. The routes themselves should be created from the script. Navigation mask. The navigation mask of the navigation sector must match the navigation mask of the route that is calculated within it. Otherwise, the sector will not participate in pathfinding. By using the navigation mask, you can specify sectors that must be ignored during pathfinding. Scaling factor for velocity of the point that moves inside the navigation sector along the calculated route. Danger factor that indicates if the point that moves inside the sector should try to avoid the navigation sector. If the danger factor exceeds the maximum danger factor set for the route, the navigation sector will be excluded from pathfinding calculations. Size of the navigation sector's box along the axes.